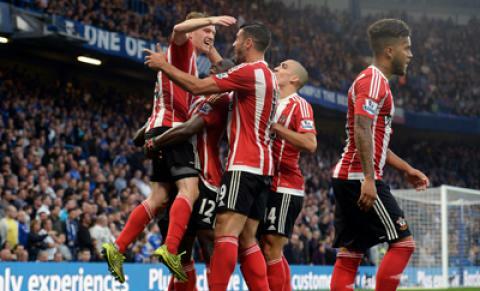 You’ll be amazed at the passion they show at St Mary’s. “When The Saints Go Marching In” will lift your footballing spirits as you join in with the love that your fellow supporters have for Southampton. The stadium becomes a cauldron of noise when the red and white stripes pour forward looking for goals and you’ll feel the hunger for success on the south coast. Sea air fills your lungs as you spend every ounce of your energy urging the Saints to success. It’s a thrilling venue to see the best that the Premier League has to offer and always certain to leave you hungry for more. Southampton enjoyed one of the best ever seasons in 2015 – 16. Their sixth place Premier League finish has only been bettered twice in the club’s history. Much of that was down to the atmosphere generated at St Mary’s. The South Coast isn’t known as a hotbed of footballing passion but any visit to Southampton will see you swept along by the fervent tide of support generated in the stadium. Here at WoW, we offer fair Southampton FC ticket prices using our secure booking system so don't wait for the last minuet and buy Southhampton football tickets today. Southampton, formed 130 years ago as St Mary’s YMA, were elected to the Football League in 1920 and spent most of the next 50 years in the lower divisions. They arrived in the top flight in 1966 and have spent all but ten years of the time since, there. The club’s finest hour came in 1976 when Bobby Stokes scored the only goal of that season’s FA Cup final to beat hot favourites Manchester United. In 1980, then manager Lawrie McMenemy persuaded European Footballer of the Year, Kevin Keegan to end his three-year stint at Hamburg and return to England. The Southampton side of the era is considered one of the club’s finest with Keegan, Charlie George and the Wallace brothers wreaking havoc with top flight defences. During 1981 – 82, Southampton were top of the table for two months but fell away in the final nine games, finishing seventh. The club were founder members of the Premier League in 1992 – 93 and remained there until 2005 when they were relegated. In 2003, the Saints lost their most recent FA Cup final appearance to Arsenal, 0 – 1 in Cardiff. Southampton has been a magnet for some of English football’s finest players with England captains Mick Mills, Peter Shilton and Kevin Keegan among those to have worn the famous red and white shirts. The club’s hero is undoubtedly Matt Le Tissier, who stayed at Southampton for his entire career, mesmerising opponents with his outrageous talent. In recent seasons, the club has been a breeding ground for some of the home countries current squads with Adam Lallana, Fraser Forster, Nathaniel Clyne, Theo Walcott, Alex Oxlade-Chamberlain and Gareth Bale all playing for the club in the last decade. The Saints returrned to Wembley in 2016/17 in the League Cup. A fantastic run which saw them beat Arsenal and Liverpool (twice). Sadly, Manchester United proved a step too far and Southampton went down 2 - 3. Despite finishing eighth in the Premier League, Claude Puel left the club and was replaced by Mauricio Pellegrino, the former Deportivo Alaves coach. Is the top seven beyond Southampton in 2017/18? With new impetus at the top, anything is possible! Mick Channon joined Southampton as a teenager, making his debut at 17. He scored against Bristol City in his first match and found the net a further 226 times. He enjoyed two spells at The Dell, spending two years at Manchester City in the interim. 1st May 1976, Wembley Stadium. Southampton, from the Second Division (now the Championship) faced Manchester United finished third in the First Division (Premier League). The Saints were rank outsiders and given little to no chance of winning. United dominated the game but couldn’t score – Ian Turner, Southampton’s goalkeeper, was inspired. With seven minutes to go, Bobby Stokes latched onto a long ball and shot across Alex Stepney for the game’s only goal. • Select your Saints FC tickets from our events table above or our match menu. You can buy for home games or Southampton away tickets. In the review your order page you will be able to review Southampton football tickets 2016-17 that you have ordered and the total price you will be paying in the next stage if you have been given a coupon or discount code, enter this in the box and click “apply”. The final Southampton FC ticket prices will be calculated and then click “Proceed to payment”. There are no hidden fees or costs and the total price you see is what you will pay for Southampton fc tickets. After payment is successfully processed you will be redirected back to our site and you will receive a confirmation message. An email with your Southampton Football Club tickets order details will be sent to the email address you have provided during your registration.